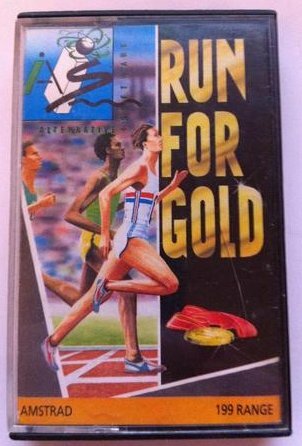 If you've had enough of wrist-wrecking sport games that demand more of your arm than your mind then sit back and relax, because here we have one that won't break your joystick and the only time it will make you sweat is with the tension of a close race finish. 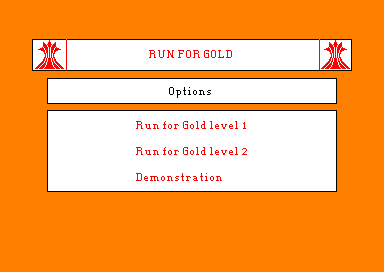 It challenges you to race over three different distances and to reach the Olympics in each one. The three events are the 400m , 800m and 1500m. Each one demands its own tactics and a long battle through three other major championships before you can get to the Olympics. Two runners arc chosen, one for the 400 and one for the 800/1500 and they will have to race against 40 other individual competitors. These nil have weird names many of which you might recognise as beir.g jumbled up versions of real runners- S Ebesco and S Marc. If the runner does false start he can't afford to do it again orhe'll be disqualified. Ho can also be disqualified for running off the edges of the track or for going out of his lane in the 400m and before the break in the 800m However it is often worth trying to anticipate the start in the smaller meetings when trying for a good time as you get another chance. In the championships you don't. There aren't too many things to control while running but there are two levels of play, one of which is very tough. 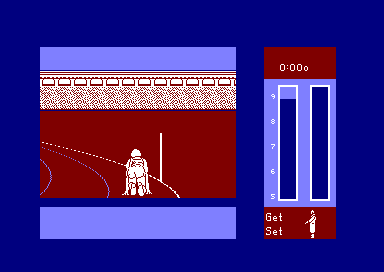 On level one the runner will keep in lane even around the bends and you control his position in the lane and his effort This is determined by two gauges on the screen, energy and speed the faster he goes the more energy he uses. Careful use of energy is needed so that you will last the race but still be able to finish strongly and beat the fast-finishing competition. tougher indeed. On both levels the other runners can yet in your way though and the runner may ever, stumble and fall, losing valuable time. You can check on where the opposition are in relation to you with a side view which also pauses the game. 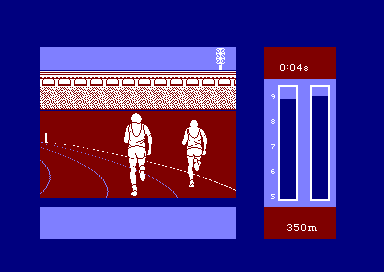 The animation of the runners is excellent although when there ate several on screen the action may noticeably slow down and when runners overlap some nasty white blobs can be created. 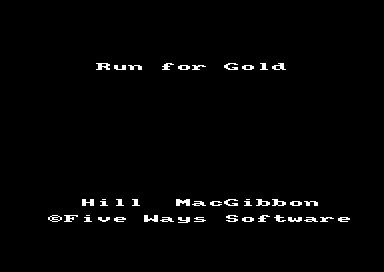 There are one or two musical ditties within the game and a lot of footsteps as you pound the track. The races demand plenty of practice and concentration but your reward could be a gold medal at the Olympics.